A sweet and fluffy bun topped with lemon icing! Available during Lent, these buns won’t be here forever. Don’t miss out! They are the best!! Gift Cards are now available to be purchased online. Click here! Give the gift of fresh local produce and homemade bakedgoods! 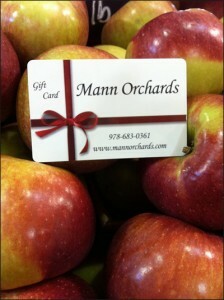 Mann Orchard’s gift cards! You choose the amount and they choose the homemade or home grown product of their choice. Great for teachers, coworkers, friends and family you really can’t go wrong with spreading the Mann Made cheer with one of our gift cards! Send someone a little bit of Mann Orchards! Choose from our array of holiday gift and fruit baskets here, and call us at (978)683-0361 to place your gift basket order today! We are now picking the freshest apples available in the Merrimack Valley! These apples don’t need to go far, merely feet from our trees to our farmstand. Its hard to get a more local apple! Call for the most up to date varieties of available apples. (978) 683-0361. Visit our farmstand and bakery at 27 Pleasant Valley St. for our apples today! A seasonal favorite our homemade Apple Cider Donuts are made with real apple cider and right in our own kitchen! Get them by the dozen or individually. Great for any special occasion, call 978-683-0361 to place an order for your next party or event! A new Mann Orchards lunch menu is created for you each and every week! Don’t miss out on this week’s menu specials! Come in and enjoy your country lunch in our very own cafe. Or call in your order to-go. To-go orders can call 978-683-0361. Check out this week’s menu! Made with the finest ingredients we are proud to sell Winfrey’s Fudge and Candy! Enjoy fresh delicious fudge and candy made in Rowley, MA. Choose from classic chocolate, chocolate walnut, penuchi and more! Try a box of gourmet candy or fudge today!